A computer system consists of a number of components. Each component performs a specific function. As graphic designers we don't need to know the details, but it is useful to know a bit about the parts of a computer system. The motherboard is also often referred to as the main board. This is the large solid state circuit board that the components of the computer connect to. 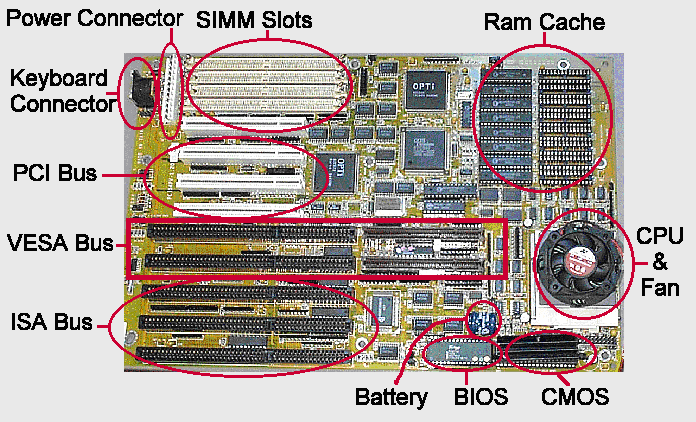 The motherboard has sockets for all the various components in the computer such as chips, network cards and memory devices. There are also connections with the various sockets in the cabinet for printers, mouse, keyboard etc. The wiring on the motherboard consists primarily of one large circuit called a bus. All the components in the system are connected to the bus and communicate with one another along it. The CPU (central processing unit) is the main chip in the computer. It interprets the instructions that make up the computer program and executes them. The CPU is also responsible for coordinating the activities of the other components, in the sense that instructions can be passed off to them by the CPU. A computer program is a series of instructions which the CPU works through in order. Each CPU has its own instruction set built in, the computer program tells the CPU which of these to execute. This is why a program written for one type of CPU will not work on another. To understand this imagine you have a robot that can step, pickup and turn. Now imagine how you might tell the robot to do these things in order to cross a room and move an object to another location. Reduced Instruction Set Computer (RISC) – Architectures use a relatively small set of instructions, and RISC chips are designed to execute these instructions very rapidly. Complex Instruction Set Computer (CISC) – Architectures use a broad set of instructions, resulting in fewer steps per operation. Graphics packages typically run a large number of simple calculations and therefore run fastest on RISC processors as a general rule. The power of a CPU is measured by the speed and the amount of data that it can process. Each CPU has a clock inside it. This clock times the execution of instructions, the CPU does something on each cycle or 'tick' of the clock. The faster the clock goes the faster the CPU can work through the instructions. There is a limit to how fast a CPU can run, and increased speed is achieved by improvements in the design of the CPU rather than just running the clock faster. The clock speed on a CPU is measured in cycles per second and modern CPUs run at 2 or more GHz (2 billion cycles per second). The amount of data a CPU can process is determined by the size of the communications channel into it. This is called the data bus. A 32 bit bus has 32 circuits on it, while a 64 bit bus has 64. 64 is obviously faster. The third main factor determining the power of a CPU is the architecture, or the design. Modern CPUs have several processors working together to share the load, which are referd to with names like "Quad core" or "Dual core" etc. When a computer salesman is describing the CPU to a customer they will typically give these three specifications, for instance Dual core (architecture) 64 bit (bus) 2 GHZ (clock speed) CPU. The chipset is composed of various computer chips on the motherboard that manages things like communication between the CPU and the other system hardware. The chipset is not something which the average computer buyer thinks about, but it is important because it determines how much memory a computer can manage and what type and how many hardware devices can be connected. So the chipset is an important aspect of the computer system design. RAM is short for (random access memory). This is the memory chip where the computer keeps the programs and data it is currently using. Generally a computer also has an area on the disk drive where it puts this data as well (virtual memory). The disk memory is much slower, so the more it can fit into RAM the faster it will run. This is why increasing the size of RAM is often an effective way of speeding up a computer. When a computer is powered down the data in the RAM is lost. These cards increase the power of a computer by adding controllers for particular devices. In doing this they take the load off the CPU. An example common in graphics computers is a Video adapter. This card has its own memory chip and processor and looks after the screen display. By taking this responsibility off the CPU the video adapter speeds up and improves the screen graphics significantly. The hard disk is a magnetic disk memory attached directly to the mother board. It is much larger than the RAM memory, but slower to access. Apart form the area used by the CPU for virtual meory the hard disk is used to store programs and data for later use. This include user files. The data is the hard drive is not lost when the system powers down. Peripherals are the external devices attached to the computer, such as printers, external hard drives, keyboard, mouse, etc. USB is short for universal serial bus. In the past each peripheral would use a specially design socket on the outside of the computer. The USB standard now means that almost any peripheral can be connect to this bus. The maximum number of USB devices that can be connected is 128, although all these devices ultimately connect into the one communication channel on the motherboard, so a large number of attached devices might make them run slowly. Note the added requirements for large scenes is extra RAM. This tells us that adding RAM is the main way of increasing the speed and effectiveness of a graphics design system.